This beauty weighed in at 13 lbs and was caught on a Paul's Fishing Kites boat long line by Terry Goodfellow and Gary Matthews. 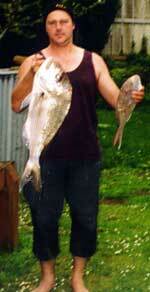 Terry writes, "We were fishing out of Kawa Kawa Beach early on Wednesday morning. 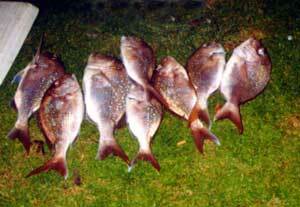 Two sets of the longline produced a limit catch of mainly pan sized snapper and the big snapper in the pic above. We were home and cleaned up by lunchtime! Ed : I think it is a fantastic photo that makes the viewer just wish they were there! I sent it to Grant Dixon at Fishing News to see if it was good enough for a cover shot for their magazine. Unfortunately it wasn't, and I think Grants comments will be helpful to those who would like to take a cover shot or win any of the thousands of dollars up for grabs in our new photo contest. The bullet points in italics were what prevented this photo from earning Terry $200.00. In explaining bullet point 4 Grant thought the way the left hand holds the fish looked a little unnatural. My advice is that when everything is perfect, as with a clean, blood and sand free fish straight from the water, stunning background and perfect light as in the pic above, talk to the cameraman about what is required and take plenty of shots. Petra and I went out kite fishing on Saturday night (the night of the full moon) with our big dropper rig. 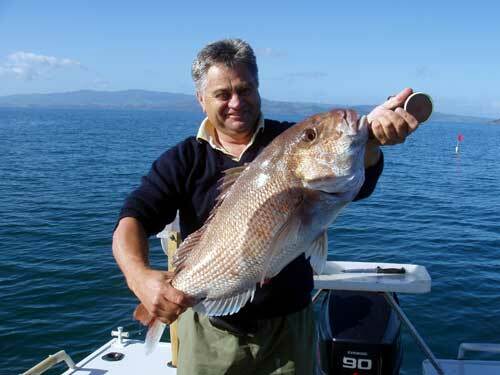 We fished from 6.30 PM until 11 PM, on one set we caught 10 good sized snapper (Pic above). We went out again on Sunday and fished from 4.30 PM till 6.30 PM We set 10 hooks 2000 metres out and caught 6 gurnard all of which were good size and really fat.